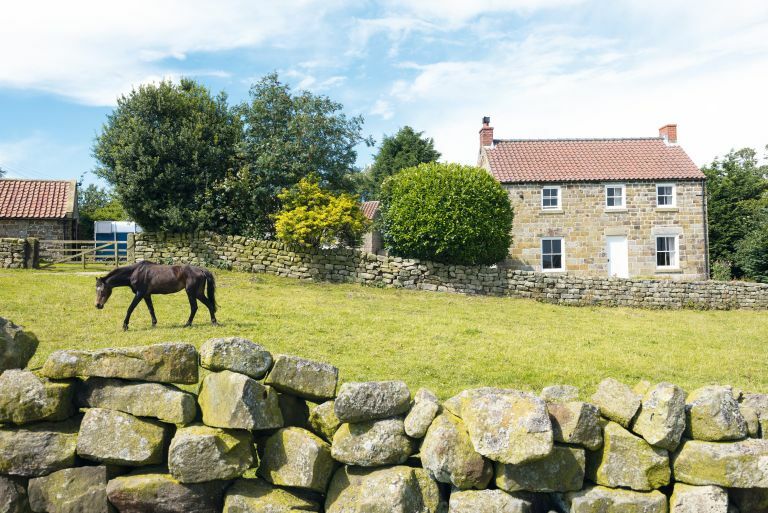 Set in eight acres, this stone farmhouse complete with paddocks, stables and views over a vast, unspoiled landscape, is perfect for a family of horse lovers. ‘The first time I came here I thought the house would be perfect for us, but we were trying to find a place completely on its own, and this is slightly overlooked on one side,’ says Barbara. So when the farmhouse owner called to say his sale had fallen through too, they saw no harm in taking a second look. Raised in the USA, Barbara loved its old English character and history, its beamed ceilings, panelled walls and the traditional black-leaded range set into a sandstone fireplace. "I agree with people who say don’t change your house as soon as you move in; you have to live with it for a while first"
They soon grew to love the exposed location and beautiful house, but draughty sash windows made for chilly winters. Their solution was to fit secondary glazing, which clips into place each autumn and is taken down each spring. ‘They’ve made a huge difference, limiting heat loss and for overall warmth when the wind comes up the dale - and of course it meant we could retain the original timber sash windows,’ says Barbara. Weatherproofing became a theme. In heavy rain, water pours down the hillside, so improving the drainage and steering floodwater away was key. All of the external stone has been repointed in lime, and there’s a rolling programme of painting the woodwork. It was their painter who alerted them to yet another key task. ‘He came down from the ladder and said: “Have a look at your chimneys…” One was quite obviously listing sideways, the other you had to be on the roof to see, but both had to be done – one completely, one partially,’ adds Barbara. In the bathroom, a new pump boosts the water pressure, a slightly shorter bath now lies against one wall and, by a neat trick, the shower bracket cuts into the ceiling to gain head height. Its mix of traditional Belfast sink, panelling and contemporary chrome fittings is typical of the couple’s skill in blending old and new. In the kitchen, contemporary chairs and lighting are teamed with a classic farmhouse sink, painted cabinets, granite worktops and stone-flagged floor. The calming backdrop suits the farmhouse’s original features and the eclectic mix of furniture. In the sitting room a clean citrus white offsets both the iron range and bespoke floral sofa, while the couple’s 19th-century tall post bed, brought over from New England by Barbara, stands out against pale cream walls. The family, she says, has found a true sense of escape here, whether on morning rides out on the hills or evenings by the fire.